I don’t think that any season is particularly good for the old skin, like when you think about it, Summer isn’t great cause it’s all hot and we sit in the sun, winter is cold and bleh, and Autumn is always a bit windy and every single Autumn, I’ve been hit at least once in face by a rogue leaf. Okay so maybe Spring is okay for the skin then. But seeing as it’s Autumn and September, let’s talk about some skincare bits that I’ve been using recently, these aren’t necessarily just for Autumn, but they’re helping to keep my skin soft, fresh and well ready to be protected from any pesky leaves. Since being on roaccutane (you can read about my journey here, and see what products helped with side effects here) my skin care routine has massively changed. My skin has changed from oily and acne prone, to normal- oily t-zone with few breakouts. Now, I know that some people out there would have make up wipes banned if they could, and believe you should be hung drawn and quartered for using them (bit extreme maybe?) but I have to admit, I used to be very PRO make up wipes. After all, they’re so easy and quick to use, they’re cheap and they do the job right? Well now, I’m not so sure, and I’ve become very loyal to cleanser in my nightly skin care routine. I used to always use make up wipes, and I’m not saying they had too much to do with my acne, but I can’t think it would have been good to have been using them, as there’s no way they took off all my make up. For the past eight months, apart from odd occasions like nights out and being away, I’ve double cleansed with cleanser. I feel like this gets rid of all my make up, and dirt etc… it’s also good for helping you to feel fresher before bed. 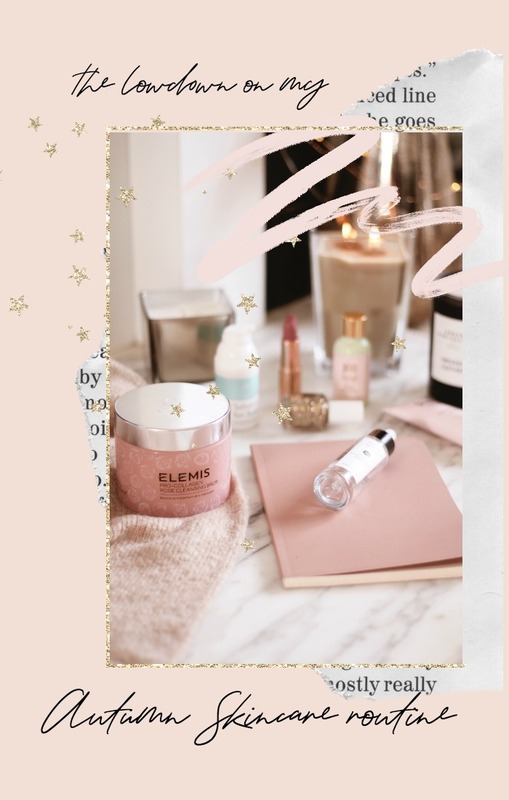 I’m currently using the Elemis Limited Edition Pro-Collagen Rose Cleansing Balm which is in support of Breast Cancer Care (I’ve just read that Elemis are donating £25,000 to the charity this year- how amazing is that?) Not only is this cleanser literally the prettiest thing ever, but it also feels lovely on the skin and I’m very much enjoying using it each night. It feels like I’m giving myself a facial each evening! Other cleansers that I have used over the past few months and have enjoyed using are ; Pixi Double Cleanse, Pestle & Mortar Cleanser, Liz Earle Cleanse & Polish. I tend to cleanse twice, so once to remove make up, and then again to make sure I’ve gotten everything. My serum of choice is the Pestle & Mortar Hyluraonic Serum, I’ve almost finished my second bottle of the stuff, and I think it’s the product that helped to keep my skin feeling normal through my roaccutane treatment. Before using it, my skin felt tight and sore, but within a couple of days, this helped to make my skin feel normal again. I find it that helps the skin penetrate product more, and its weird cause you don’t think it would make a different but it really does. Yes it’s pricey, but its’ so good, and I will be picking up a third bottle soon! I even have got my sister obsessed who’s on her second bottle too! I’ve been using Science of Skin’s Solution For Scars as a treatment for any red marks left behind by spots. I find this cream helps to eradicate any redness and does fade scars/marks left by acne. I haven’t used it on a scar on any other part of the body so can’t comment but did find it really helped to clear the red marks on my cheeks. It’s also very gentle on the skin and vegan too, so you don’t need to worry about it irritating your skin/breaking it out. I really like it though and have found it to be a bit of a god send for my marked cheeks! I don’t tend to use moisturisers, instead I mainly use oils, I have been using the Pixi Beauty Sleep Cream though now and then. However, usually I tend to slather on some oil for moisture. I’ve been liking the Decleor Neuroli Oil and Pixi Rose Oil as nightly treatments, I tend to add a few drops to my face and massage in. They keep my skin feeling moisturised and fresh, and they don’t break out my skin or irritate it which is really good! My skin is about 85% clearer than it was, but I still get the occasional spot/s. I’ve been using the Superdrug Calm Skin Rescue Gel as a spot treatment and it really does help to reduce spot size and redness. It’s only cheap but it definitely works! And I think that is everything – like I said I have completely simplified my skin care routine recently, and everything is very gentle and natural. I’ve found that my skin is reacting well to the products and so far – four months post roaccutane it’s doing well! Otherwise, what is your favourite skin care product right now?